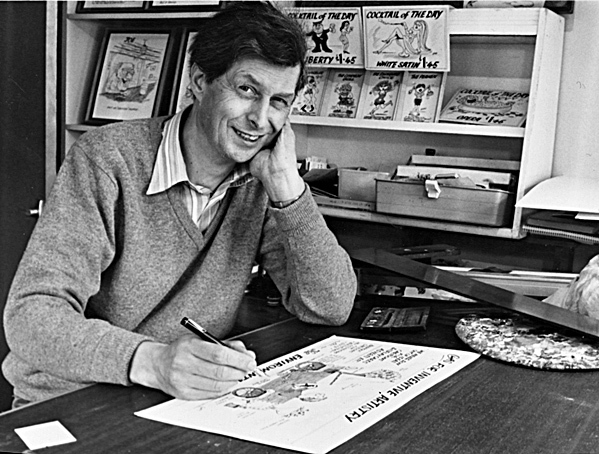 Chas Saunders, universally known simply as CHAS, was a much-loved British cartoonist, writer, humourist, board game inventor, jazz drummer and founder of the Pubology Society. Chas passed away in the summer of 2011, leaving behind a huge body of work and a rich legacy of happy memories. This website celebrates his life, his work and the endlessly eccentric personality of a man known to spell-checkers across the world as CHAOS SAUNTERS. “It is not known quite where or how CHAS came about. He claims he cannot remember a time when he was not here. If he was born, he wishes to apologise for any inconvenience. As an outgoing recluse, it is sometimes difficult to find him in. If he is in, it is often hard to tell which inn he is in. He makes no claim whatever to fame. Being aware that he is a legend is sufficient. If the public cannot grasp this, he has no wish to gripe about their grip on things. CHAS has never worked on a ranch, been a taxidermist’s assistant, sold double glazing, taught geography, been in a closet, eaten quails in aspic, set fire to a five pound note or worn flares. He has at various times been sighted in a film, astride a motorcycle, through a viewfinder, behind a drum kit, on a mission, under the weather, down on his luck, up the creek, among the survivors and where it’s at.